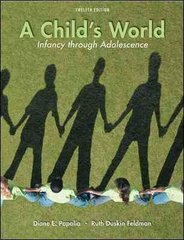 A Child's World: Infancy Through Adolescence 13 Edition This fully-revised thirteenth edition continues to provide the extensive cross-cultural and multicultural coverage, the innovative pedagogical learning system, and the balance between research and real-life applications that has made A Child's World a favorite of students and professors alike. The new edition was revised using McGraw-Hill's Heat Map Technology, which gives authors access to real data from real students to create their revisions. This data is anonymously collected from the many students who use LearnSmart, the adaptive learning tool that provides students with an individualized assessment of their own progress. Because virtually every text paragraph is tied to several questions that students answer while using LearnSmart, empirical data showing the specific concepts with which students have the most difficulty is easily pinpointed for the authors to review. In addition to those areas that have been reworked for clarity in the thirteenth edition, “StudySmart” icons are placed in the most important hot spots in the chapter based on student data. These icons lead students to digital assets that enhance their understanding of challenging concepts.